While doing your job as a CIA Analyst, you find something that will rip your family apart. Do you reveal it to your superiors? Vivian is a counterintelligence agent with the CIA. While employed, she developed a new program to find Russian sleeper cells inside the United States. She is married with a perfect husband and four kids including a set of infant twin boys. Without providing spoilers, Vivian discovers something that may rip her family apart. Even with confirmation, she decides to approach the problem from a unique angle leading to a twist-filled tale of conflicting loyalties. The author was formally a CIA Analyst so she knows of what she writes. To be honest, that is actually scary since the security at the CIA seems remarkably lax. 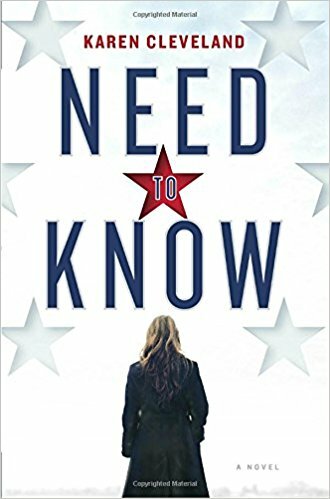 Need to Know is an enjoyable fast-moving read. The best part is the fantastically unexpected ending. It has been optioned to be a movie with Charlize Theron. I can’t wait! 4 stars! Thanks to the publisher, Ballantine Books, and NetGalley for the review copy.